With changes below, this warrants five stars. Okay, I am NOT a purist and use whatever tastes best. White Northern beans I find a little boring, so I used a bulk foods 13 bean mix, which had split peas, lentils, pinto, black, black eyed peas, garbanzo and several other types INCLUDING White Northern. This bean mix is cheaper, especially in bulk, and possesses a much more complex flavor than just white beans alone. Second, in the six cups of water I used half chicken broth and half vegetable broth (both Better than Boullion) so that the flavors better complimented the vegetable mix in the soup. Cayenne pepper instead of black, to go with the smoky flavor of half a pack of bacon (as opposed to straight ham, it was all I had on hand). I added 1 teaspoon celery seed to go with the celery stalks, plus three large carrots. Also, though I had diced tomatoes on hand I figured hand-chopped Roma would add more flavor and better texture. The beans were soaked overnight, so the soup only needs three hours on high in the crock pot to combine and reduce properly. Served with homemade cornbread it was PHENOMENAL! 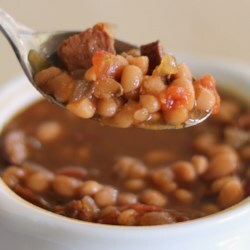 One of the best bean soups I have had, with the tweaks. Perhaps it is not Navy Bean anymore, but I think the taste is quite a lot better.